The purpose of this study was to evaluate the potential of oral combined cannabis constituents to reduce nausea. The objective of this study was to determine the effect of combining subthreshold oral doses of Δ9-tetrahydrocannabinol (THC) and cannabidiolic acid (CBDA) on acute and anticipatory nausea in rat models of conditioned gaping. The potential of intragastric (i.g.) administration of THC, CBDA, or combined doses, to interfere with acute nausea-induced conditioned gaping (acute nausea) or the expression of contextually elicited conditioned gaping (anticipatory nausea), was evaluated. For acute nausea, i.g. administration of subthreshold doses of THC (0.5 and 1 mg/kg) or CBDA (0.5 and 1 μg/kg) significantly suppressed acute nausea-induced gaping, whereas higher individual doses of both THC and CBDA were maximally effective. Combined i.g. administration of higher doses of THC and CBDA (2.5 mg/kg THC-2.5 μg/kg CBDA; 10 mg/kg THC-10 μg/kg CBDA; 20 mg/kg THC-20 μg/kg CBDA) also enhanced positive hedonic reactions elicited by saccharin solution during conditioning. For anticipatory nausea, combined subthreshold i.g. 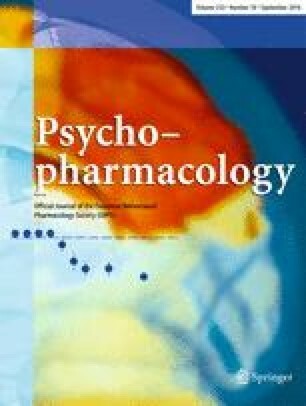 doses of THC (0.1 mg/kg) and CBDA (0.1 μg/kg) suppressed contextually elicited conditioned gaping. When administered i.g., THC was effective on its own at doses ranging from 1 to 10 mg/kg, but CBDA was only effective at 10 μg/kg. THC alone was equally effective by intraperitoneal (i.p.) and i.g. administration, whereas CBDA alone was more effective by i.p. administration (Rock et al. in Psychopharmacol (Berl) 232:4445–4454, 2015) than by i.g. administration. This work was supported by a Natural Sciences and Engineering Research Council of Canada (NSERC) Collaborative Research and Development Grant (CRDPJ 476416–14) to LAP in partnership with Prairie Plant Systems Inc, as well as grants to LAP from NSERC (92056) and Canadian Institute of Health Research (137122).